Creativity has become “a kind of moral imperative” (Osborne, 2003). But while it’s often on the ‘to-do’ lists of business people, how many of us believe we can be creative? I worked for a multinational pharmaceutical company as R&D project manager to develop innovative drugs. My key learning from that experience is that group synergy is the source of creativity, without which innovation cannot happen. This learning led me to conduct action research to develop a group coaching model to cultivate creative confidence as my MA degree dissertation. The outcome was highly positive, demonstrating the model’s viability. Scott et al (2004) report that the creativity training market is expanding, and there are an exponentially increasing number of books on ‘how to be creative’. Many tend to be ineffective – as coaches, we know that simple how-to instructions generally don’t change people’s behaviours nor does ‘stick and carrot’ mechanistic motivation work. Instead, Pink (2011) says that what best motivates us is mastery, autonomy and purpose. However, I would argue that even more fundamental is our mindset. We need to first believe in our creative potential otherwise our limiting assumption could also limit what we can possibly achieve. As Kelly and Kelly (2013) say, “belief in your creative capacity lies at the heart of innovation”. Cultivating creative confidence is an effective starting point for nurturing one’s creativity. We are all inherently creative, say creativity researchers. Richards (2007) says: “We all have creativity – it actually keeps us alive, and it helps us thrive”; Sawyer (2012) states that “creativity is part of what makes us human”, and Runco (2007), notes: “simply put, it is human nature to be creative”. Yet many of us believe we’re not creative, perhaps due to negative messages from family or school, or workplaces that discourage creativity for the sake of conformity, or beliefs that creativity is reserved for ‘proper’ artists. However, creativity is not limited to art, but can also be applied to any activity in life. Everyday creativity can be defined as anything that is original and meaningful, at least to the creator. Sawyer (2012) says that: “creative people are happy and productive, and tend to be successful – nothing like our myth of the tortured lone genius”. We were born with a creative muscle, and recognising it and developing it is a key source of well-being. Creativity is an expression of our authentic self. Richards (2007) describes how practising creativity enhances our raison d’être and increases quality of life, while supressing creativity causes physical and mental disorders. 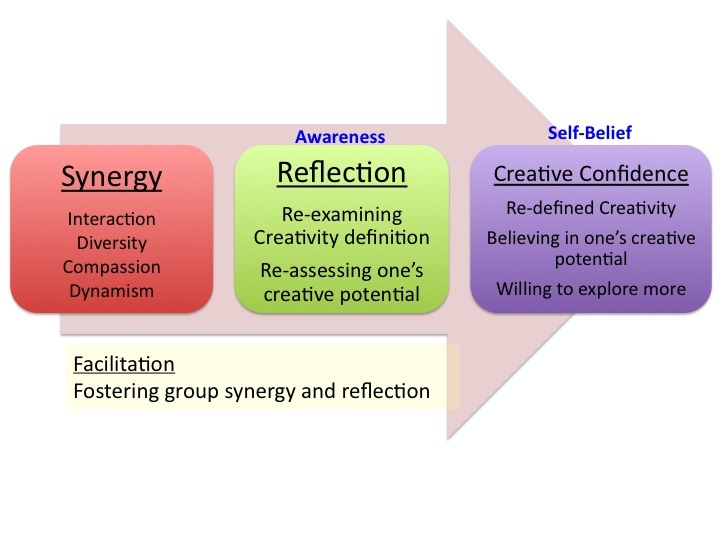 From a coaching perspective, it is important to emphasise that creativity is closely linked to self-actualisation. Rogers considered creativity and self-actualisation to be inseparable twins. Hence, cultivating individuals’ creative confidence could provide a solid starting point for achieving other coaching goals. Coaching approach: the role and responsibility of the group coach. The core activity of the session was reflection, either in pairs or groups, on the topics related to the contents. As creativity is a sensitive issue, requiring people to feel safe to ponder it, I adopted Nancy Kline’s Thinking Environment as a group coaching framework because it creates a climate of trust and compassionate space. The average rate among 38 participants was lower than 1.5. The study has demonstrated the schema of effects in which participants can reach true knowledge of their creativity, as shown in Figure 2. It is the coach’s facilitation skills that make synergy form and awareness emerge as the result of reflection. The coach needs to set the right tone to develop and maintain group synergy, which requires a high degree of confidence and facilitation maturity. However, when it comes to delivery, I found that confidence in human potential was the most effective quality for a successful session. Trusting participants as much as myself improved my facilitation, and the group’s synergy developed naturally. I noticed that the less I intervened, the more high-quality reflection emerged. It was in that space of minimum intervention that I heard more creative confidence statements such as ‘I am actually creative’. Such self-awareness motivates the person to explore their creative potential further. The model can also be used as a team building tool when, for example, kicking off a new project or new team. It quickly connects people on a deep level and can bring up new insights about self and teammates. This awareness cultivates respect and trust in the team, which usually takes a great deal of time and effort. Developing an effective team is one of the biggest challenges that project managers face – something I myself struggled with. When I observed how quickly my research participants connected during the session, I was stunned. I am not, however, suggesting a quick-fix. Developing an effective team, or developing creativity, requires perseverance and we often procrastinate. But if we have confidence in our team and our creative potential, we are motivated to start the journey. As the journey could become an enjoyable learning and growing process, success is more likely. In today’s unpredictable world, creativity enables us to be resourceful and elegantly dance with changes. As Osborne (2003) argues, we need to disenthrall ourselves from the dogma of creativity and, instead, recognise it as a gift that we inherently have to thrive with an unpredictable world. Hennessey and Amabile (2010) advocate creativity as ‘one of the key factors that drive civilisation forward’. Group coaching to cultivate creative confidence can offer a great opportunity for us to contribute to the well-being of individuals and to social well-being. Japanese and based in Switzerland. TRIED AND TESTED: PART 1 – CAN YOU PICTURE THIS? WHAT’S LOVE GOT TO DO WITH IT?